After visiting Xi’an, the next stop on my 12-day trek through China was Beijing. When I made the trip, Google Maps didn’t display any detail for China, with the exceptions of Hong Kong and Macao, but it seems that the Chinese government relaxed and cooperated in time for the Olympics, and now there are full street maps and the satellite images zoom in all the way. That would have made traveling much easier, but oh well. I arrived in Beijing by overnight train at around 7:15am, not well rested, but not a mess either. I’d paid the $56 for a bunk in a “soft sleeper,” which is a good price considering that it combines lodging and transportation and is cheaper than a plane ticket. A “hard sleeper” goes for $36, but those sell out quickly and are, of course, less comfortable. They have triple bunks, no doors, and thin mattresses, whereas soft sleepers are in lockable 4-person compartments, with somewhat better beds. My three bunk-mates, two men and a woman, were traveling together, and amazingly, were also English-speaking foreign residents of Japan. They were university students, and like me, they were on a spring break vacation. One guy was from Kuwait and the woman and the other man seemed to be from Southeast Asia, maybe Malaysia. 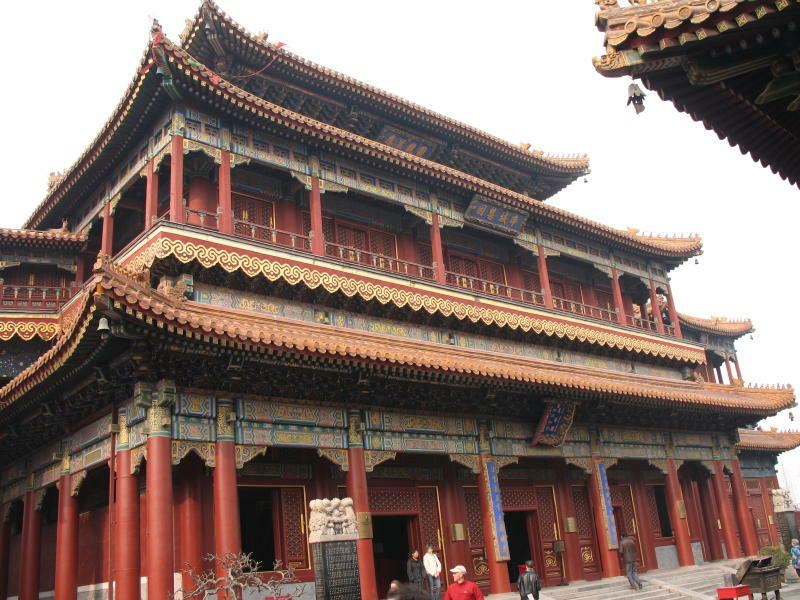 We compared our experiences in Xi’an and I mentioned that I really liked the Great Mosque. The Kuwaiti said that the three of them had also visited the mosque, and at the gate, he said hello in Arabic and was greeted with a “Welcome, brother!” and had his entrance fee waived. But his two non-Muslim companions had to pay, which he viewed as discriminatory. I thought that it spoke well of him that he felt that way, but I can understand the mosque’s policy. If non-worshipers didn’t have to pay, then the mosque would have constant problems with vendors, beggars, and scammers, and it would be difficult to maintain the tranquility that I admired so much. After arriving in Beijing’s South Station, the three students and I parted ways, and I headed out into the gray and drizzly morning in search of breakfast. Yoshinoya, a Japanese fast food chain, was the only restaurant in the bleak area around the station (which, like much of the city, was under heavy construction), so that’s where I had my first meal in Beijing. I would rather have eaten local food, but at least it was cheap and filling. After breakfast, I found my hotel, dropped off my luggage, and then went back out into the city. 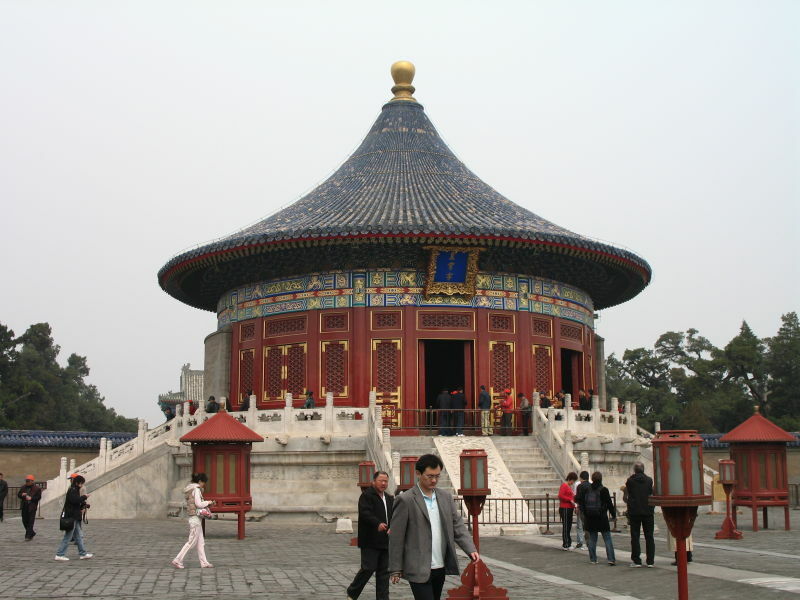 I spent the rest of the morning at the Temple of Heaven. The playing field to the east gives an idea of how big the place is. 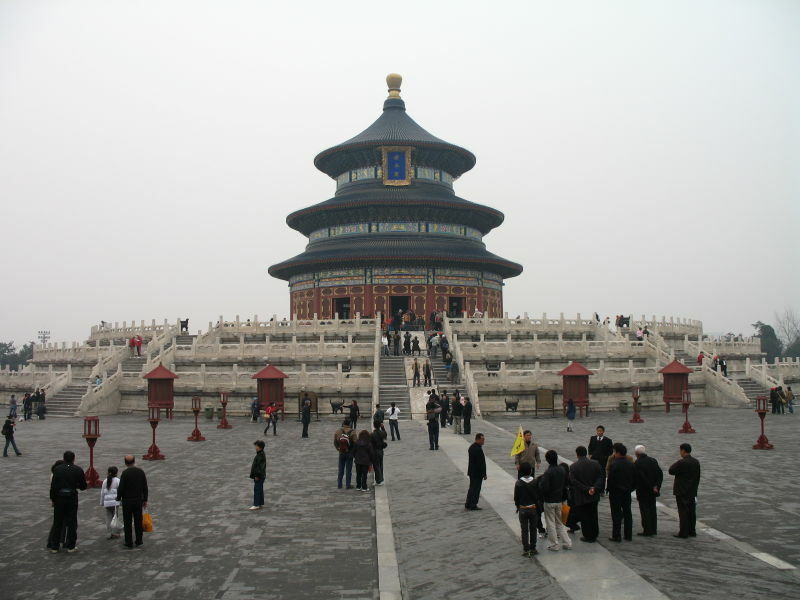 Built in the early 1400s, the Temple of Heaven was visited yearly by emperors of the Ming and Qing dynasties, who performed rituals here to pray for good harvests. Appropriately enough, the main building – the northernmost dark blue mark on the map – is known as the Hall of Prayer for Good Harvests. The blue roof tiles represent heaven, as do circles. Earth, on the other hand, is represented by squares. 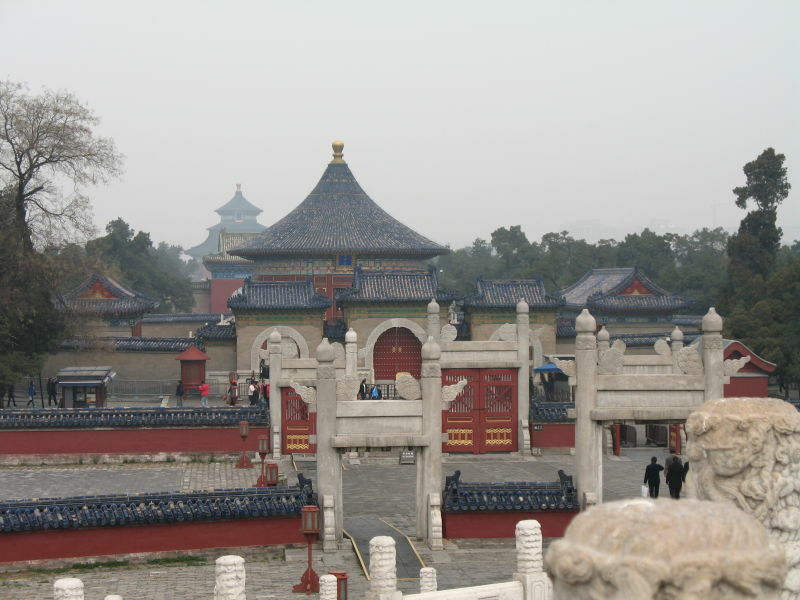 Following the long path south of the Hall of Prayer leads to the Imperial Vault of Heaven, which holds imperial ancestral tablets. The vault is surrounded by the Echo Wall. Supposedly, two people standing at opposite ends of the courtyard can hold a conversation in normal speaking voices, thanks to the acoustics of the wall, but it was too noisy with visitors when I was there. Just south of the Imperial Vault is the Circular Mound Altar. The number nine is associated with the emperor, and the flagstones forming the top of the mound are arranged in nine rings around a center stone, with a multiple of nine stones in each ring, so that the inner ring has nine and the outer ring has 81. This is the view back to the north. Lunch was a bit of a disaster. I wanted to eat Peking duck in its home city, but I picked a lousy restaurant. After I ordered, restaurant employees sat down nearby and had their own lunch while I waited half an hour before getting any tea, and another 15 minutes for my food. And when the food finally came, it was pretty mediocre. I had better Peking duck in Yokohama. So if you’re ever in the neighborhood just south of Tiananmen Square, don’t bother with Jinzhengyang Restaurant (金正阳酒楼), eat somewhere else. I spent the afternoon at Yonghe Temple, commonly known as the Lama Temple. 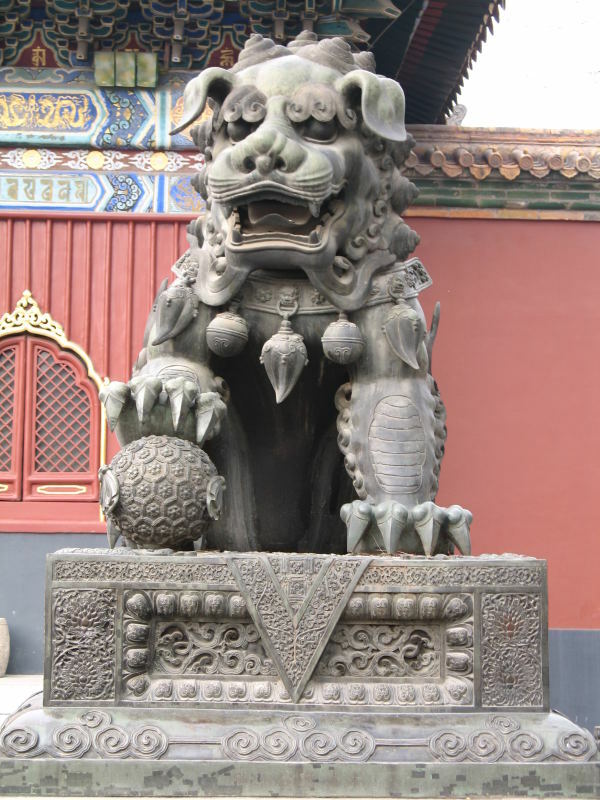 As the name suggests, the Lama Temple belongs to the Tibetan branch of Buddhism. 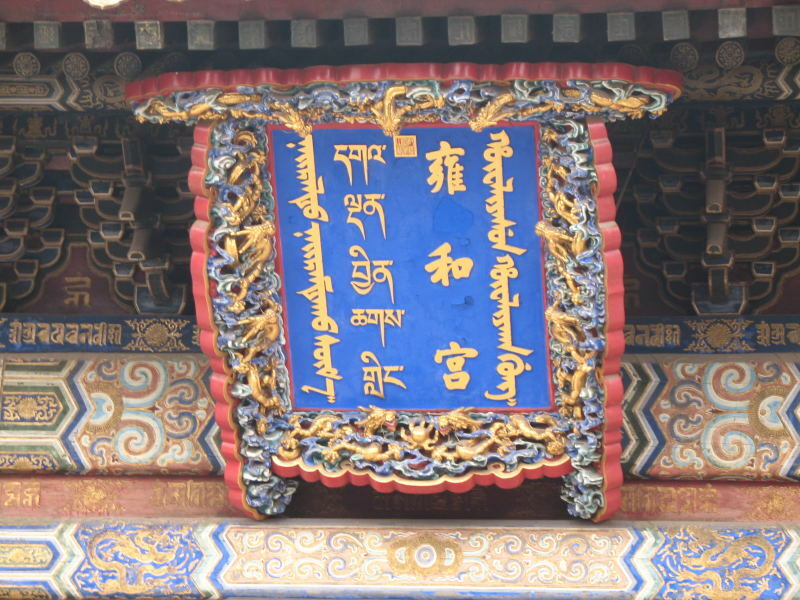 The temple’s name plate is written in four languages. From left to right: Mongolian, Tibetan, Chinese, and Manchu. 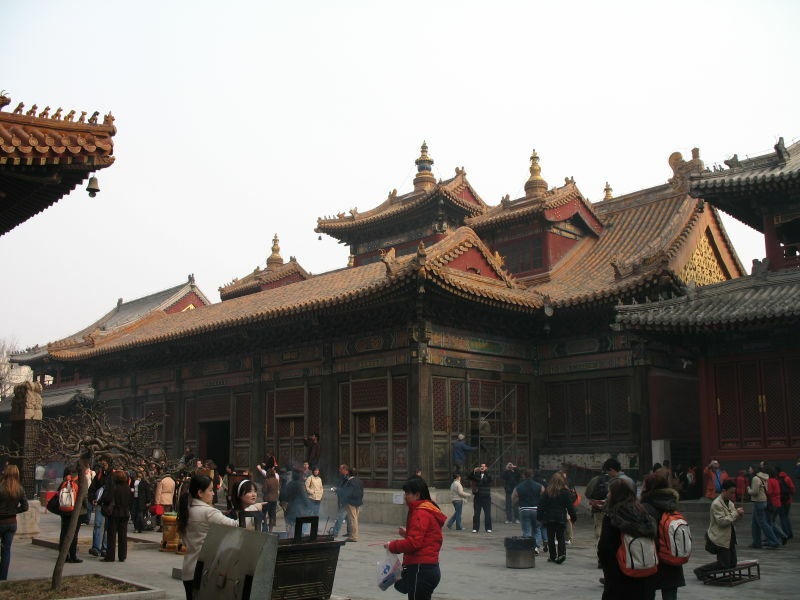 The Lama Temple was originally built as a residence for court eunuchs in 1694. In 1711 it became a prince’s palace, and when the prince became emperor in 1723, he converted half of his former palace into a lamasery. The other half was converted following the emperor’s death in 1735. It became the city’s largest and most important Tibetan Buddhist temple and was given imperial status, marked by yellow roof tiles. 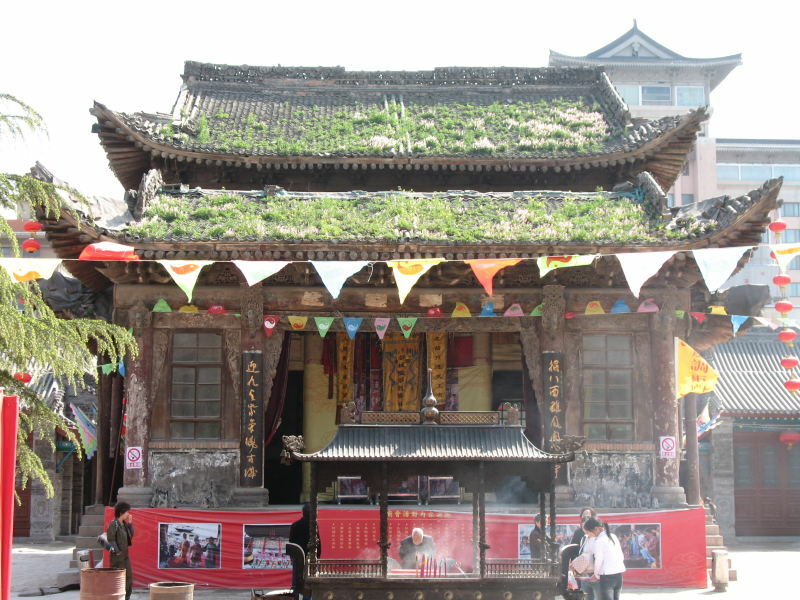 The temple was spared during the Cultural Revolution – which saw many other temples destroyed or made into factories – purportedly due to the intervention of Premier Zhou Enlai. The buildings in the temple are packed closely together, making them hard to photograph. I tried (too) hard to fit this one in the frame, but it wasn’t happening. Inside, by the way, is the world’s largest statue carved from a single piece of wood, an 18-meter-tall figure of Maitreya, the Future Buddha. Alas, no pictures were allowed in any of the buildings. But here’s a neat guardian lion. The restaurant says it serves fusion food, but I’d describe most of the menu as Chinese home cooking with a Sichuan bent. In any case, the food was inexpensive and very good. I returned to my hotel with a happy stomach and collapsed into bed. The next day I visited the Great Wall. I spent the last few weeks studying for the CompTIA A+ certification, and now that I’ve passed the two tests (Woo hoo! ), it’s high time I attended to this blog. I’m writing a post on my visit to Beijing, but while I’m working on that, here’s a random picture. 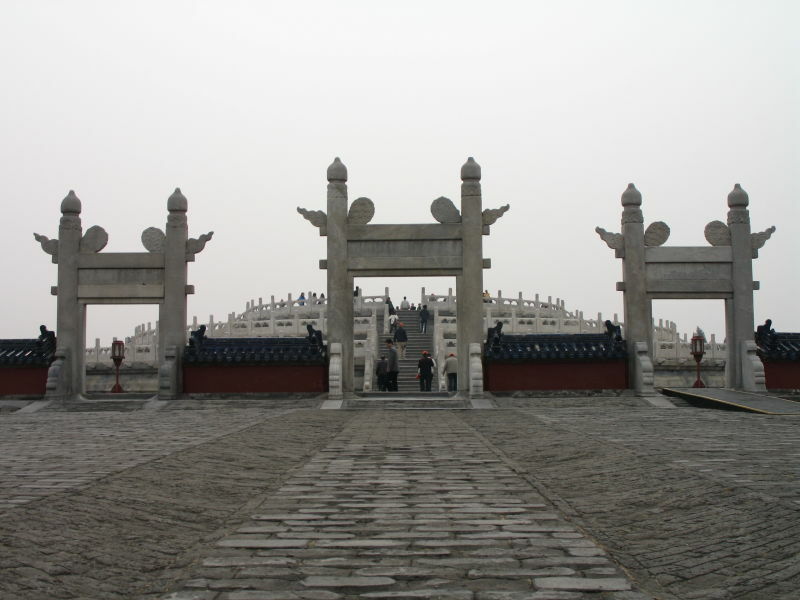 This is at the Temple of the City Gods, in Xi’an. There wasn’t that much to see, especially with several buildings under renovation, but this and Hong Kong’s Man Mo Temple are the only Taoist temples I’ve been to. You are currently browsing the Erratic Dispatches blog archives for October, 2008.